As 2014 draws to a close, there have sadly only been a few bright spots for Trivandrum in the sphere of economic development with most major projects including Vizhinjam, Knowledge City, the MRTS and road development in suspended animation. The most notable certainly has been the wonderful progress made towards the completion of the world-class Trivandrum International Stadium. Here's another brilliant photo-log from the folks at Thiruvananthapuram Updates. Thanks, guys, for keeping everyone updated on the status of this landmark project that the Kerala media have (thankfully!) chosen to ignore. I confess, I have been away for over five months. 150 days. Nearly half a year. Shameful! Guilty! I do have a little bit of an excuse, a professional one, and one related to Trivandrum. In a good way, I promise. While I have been chipping away at it for over two years now, the last few months have seen a frenzy of activity as we finally closed a long drawn out acquisition process for what will, hopefully, be a landmark development for Trivandrum, generating tens of thousands of much needed jobs and creating a truly world-class piece of urban infrastructure. Not the lamest of excuses, I hope. And hopefully while this should keep me very busy in the coming months, I will find more time to post regularly here. If you'd like to know more about our project, you can check our the Taurus India website and Facebook page. In the meantime, the only other significant project to make any sort of headway in Trivandrum over the last few months and years is the Trivandrum International Stadium. Here's where it stands 61 days before the Opening Ceremony, a hive of feverish activity, with more mobile cranes in action than any other construction site that Trivandrum has seen before, one that would not be quite out of place in New York, Dubai or Shanghai! Lots of great pictures of the stadium here and here. 35th National Games from Jan 31 - Feb 15, 2015 in Trivandrum! The 35th National Games of India will be held in Kerala, predominantly in Trivandrum, from January 31 to February 15, 2015. Trivandrum not only hosts the lion's share of the events at about half a dozen venues across the city as well as the state-of-the-art Games Village but the State Capital will also be the venue for the Opening and Closing Ceremonies of the Games, at the upcoming, stunning new International Stadium near Technopark. To remind us of how close we are to the Opening Ceremony, I will keep a countdown timer at the top of the right border of the blog till the Games are done! The 50,000 seat Trivandrum International Stadium is taking final shape as concessionaire IL&FS commences construction of the raker beams that will support the upper level of pre-fabricated stands. The first set of sloping beams, the first of their kind in any Indian stadium, are already up near the North Pavilion, giving a good idea of how high the final structure will be. The whole structure will be topped by the state-of-the-art membrane roof and lighting towers. Check out the rest of the latest images here. Click on the images for the high-resolution versions. The nearly 1,000,000 Sq.ft. Phase I building of the UST Global campus nears completion, with the first occupants due to move in June/July before a formal inauguration in September. Trivandrum Makes the Right Choice - Welcome Back, Dr. Tharoor! The hardest fought election in the history of Trivandrum has come to a close and the best candidate has won, amidst a troubling mandate for divisive forces across India. A big vote of thanks to the 296,319 voters who saw past the hype and voted for the demonstrated reality of a solid track record and an extraordinary personality. An equal measure of gratitude to Dr. Tharoor for overcoming gut-wrenching personal tragedy and persevering through a grueling campaign, sadly laced with disgusting attacks by the opposition. Congratulation to those who voted for him, against him and didn't vote at all, for getting the best possible MP to represent them for another five years. Looking forward to achieving even greater things for Trivandrum, stay tuned! No More National Highways for Kerala! After years of incessant protests demanding the reduction of the width of in-development stretches of National Highways in Kerala down to ridiculous extents, the National Highway Authority of India has finally given up on the State and abandoned the two pending stretches of road, Kazhakkoottam-Cherthala and Edapally-Kuttipuram. Currently, the only stretch being tendered for 4-laning is from Kazhakkoottam-TN Border, where the final bid is due in June. Together with the completed stretches from Cherthala to Edapally and from there till Walayar, this will be the only stretches of 4-lane road in India's most densely populated State. A State where 35 Million people have one of the highest rates of car and two-wheeler ownership in India and where the entire NH system often resembles a State-wide traffic jam. This perennial gridlock results in massive losses to the State's economy and very significant, always tragic loss of life through thousands of road accidents and in the delay incurred in getting patients and accidents to hospitals because of the perennial traffic congestion. Yet again, the State Government continues to wallow in its disastrous track record of infrastructure development, especially in any place outside the borders of the Ernakulam district. While it's been long overdue, the demise of highways in our State joins the growing pile of wreckage that includes Vizhinjam, the Trivandrum MRTS and assorted urban infrastructural projects - such as the trifling matter of the breakdown of solid waste management in the Capital city - across Kerala (except, of course, in Ernakulam!). Kudoes to all the persistent anti-development activities (yes all of you protesting without knowing why or because you think your neighbor got a better deal than you did! ), spineless politicians (for giving us that rarest of rare occurrences, a political consensus!) and to successive Governments who seem to have lost all sense of what constitutes public interest. Thanks for blowing up the issue out of all proportion, exaggerating the extent of land acquisition and displacement of people and for sharply polarizing the BOT debate. You have won, the rest of us, the whole of Kerala has lost! Each time the voting machines are dusted off in Trivandrum, I try to share the most candid and most pragmatic recommendation on which candidate is likely to be the most beneficial to Trivandrum. My aim is to keep it simple, not to mix in national or international issues, just who would be best suited to take Trivandrum forward on its journey to become a global city and to make sure that it receives all that it deserves as the State Capital and a vibrant economic hub. Am I trying to solicit votes? Yes, in a sense I am. Not for personal benefit or for the sake of personal relationship with any individual. Nor for the sake of ideology. And of course not for any sectarian preferences, because one needs religious beliefs or subscription to a particular community to be sectarian. My views are based purely on well over a decade of groundwork, convincing, cajoling and campaigning for the development of Trivandrum. I do not try to presume that I know more than any of you, but believe that all the facts from a development point of view may not be readily available unless one is as obsessed with the subject or with how different individuals and organizations respond to it, as I have been. From my previous post, it's very evident what the conclusion of this post will be. But let's examine the choices logically before forming a recommendation. This article will only cover the Trivandrum constituency, and not Attingal, because the former includes most of the core urban area as well as almost all of the key projects in the city including Technopark, Vizhinjam, the MRTS, the NH-66 4-laning project, the Karamana-Kaliyikkavila 4-laning project and the International Airport. Firstly, what's the vision of each candidate for the development of the constituency which comprises Trivandrum. The most direct way to understand this is to listen to the candidates themselves. In this regard, it's shocking that only Dr. Shashi Tharoor had a clear list of development action points ready at the start of the campaign. The other candidates - from the LDF, the BJP and the AAP - only came up with this quite literally as an afterthought, almost at the fag end of the campaign! This is when all these parties knew that they would field a candidate. Indeed, it was a foregone conclusion that the BJP would field their recurrent choice, O. Rajagopal. That none of these folks had an agenda ready goes to show that none of them really take the development of the city seriously. After that round clearly went to Dr. Tharoor, let's look at each of the candidates to judge their pros and cons. To this end, I have come up on a pretty comprehensive and very wittily written blog. It's in malayalam but I am sure that the vast majority would be able to read it. It chooses an interesting format, to ask a serious of tough questions of each candidate, and then to put up its version of each answer, revealing much about each candidate's performance. Let's start with the Aam Admi Party. Notwithstanding its lofty ideals and the supposed democratic nature of choosing its candidates, there does not seem to have been much choice in its candidate for Trivandrum, who seems at best a very poor attempt at copying the incumbent - complete with a vague UN stint and an (State-funded?) education in Cambridge, Massachusetts. Their manifesto relegates their original ideal of transparent, non-corrupt Government to the 11th of 12 action points. An excellent way to start, turn the bedrock of your agenda into an afterthought! And one would be forced to look hard and wide to even find mentions of such trifling projects as Vizhinjam (that too from the perspective of "protecting the rights of fisherfolk") while the MRTS does not even merit a mention. According to AAP, the priorties in Trivandrum are water-supply, education, healthcare and better footpaths! Wait, what? Really? It doesn't take much to conclude that the AAP is trying to flog a standardized script which makes a lot of sense perhaps in a village in Bihar, not in a cosmopolitan city like Trivandrum which has one of the highest standards of education and health care in India! It's evident that beyond a fad, the AAP has no specific interest in Trivandrum. No better indicator than the fact that their State HQ is not located in the State Capital! On to the LDF. It's no secret that if I have ideological leanings, it's towards the left. The LDF has a lot of leaders for whom I have the utmost respect, for their sincerity, capabilities, strong ideals and their commitment to the development of the State Capital, be it former Minister M. Vijayakumar, late MP Varkala Radhakrishnan, VS or current Rajya Sabha MP K.N. Balagopal. I also respect the fact that they have been the most committed to the principle of secularism. Which is why this time's clearly sectarian choice of candidate has been a crushing disappointment. And I am not the only one to be disappointed, it appears that even some party office bearers view this as having gone too far in compromising ideologies in order to give the incumbent a run for his money. When the CPI itself has plenty of candidates to offer, going in for someone with no background in politics or public service and with a lot of baggage from his role at a private medical college (often at the storm of protests led by Left student organizations!) is very surprising. And as far as I understand from second-hand impressions, the candidate also lacks in charisma, the ability to communicate and in clarity of thought and purpose about the development of Trivandrum. Being a first timer, it's impossible to evaluate his track record, so we will have to look at what his LDF predecessors have achieved in their terms. The simple is answer is that the last couple of LDF MPs - PKV and Panniyan Ravindran - have achieved precious little, if anything. My only interaction with the former was when he expressed little interest in pursuing the Vizhinjam project when approached soon after his election. Of course, he expired soon after. As for his successor, the only notable achievement that I can think (other than his funky hairdo and his habit of coming to functions on the back of someone's two wheeler) was when he joined Varkala to protest against the delays to the Vizhinjam project in front of Parliament, back in 2006. With a thoroughly lacklustre candidate chosen on a very narrow agenda and the promise of being in the Opposition whichever alliance comes to power post the Election, even a Left-leaner like me can give no reason in registering a vote for this gentleman. This brings us to the candidate of the BJP, someone who's become quite a fixture during election time in Trivandrum. I'd immediately preclude him for representing an openly communal party, which is building a dangerous personality cult even while decrying the Nehru dynasty of the Congress. But let's look at his record. His supporters claim that he has achieved many, many magnificent things when he held not one but four important portfolios as Minister of State - Railways, Defence, Law and Urban Development - during the tenure of the NDA under Vajpayee. But an objective evaluation of what he actually achieved for Trivandrum reveals very little - four or five new trains, a couple of new platforms at Trivandrum Central, a mid-scale defence contract for Keltron and the forlorn foundation stone for the still-born Habitat Center.....well, that's about it. Really? Despite having been MoS for Law, he did nothing to restore the HC Bench in Trivandrum (bringing in a law mandating at least a HC Bench in ALL State Capitals would have been easy), nor did he do anything for the Vizhinjam project nor for the development of the then NH-47 at a time when the NDA was building highways all over the place. The plain truth is that O. Rajagopal was inserted in through the Rajya Sabha in order to shower "blessings" across Kerala in the hope that the BJP may manage to win an Assembly or Lok Sabha seat somewhere. Of course, this didn't pan out. To put things in perspective, the biggest development project that he was involved with was the Nedumbassery Airport in Ernakulam, where he helped secure a lion's share of the initial funding via HUDCO! Right now, the biggest stated reason for electing the veteran politician is that given the "certainty" of an NDA Government, he will be given a Cabinet berth. The most likely outcome of this, if it does happen and right now the only certain thing about the aftermath of the Polls is that there'll be chaos in Delhi, is that Rajagopal will gain distribute goodies all across Kerala in a vain attempt to swing more votes. Of course, if the NDA wins and he loses, he will still have the Rajya Sabha route open like last time, so there's no merit in even considering his candidature from this perspective. I used to respect this gentleman, for his sheer persistence if nothing else, but the thoroughly distasteful smear campaign against Dr.Tharoor launched by him weeks before he even filed his nomination took that little shred of respect away. Like the rest of the NDA's supposed sheen, not to mention its demagogue, O Rajagopal's track record is little more than urban legend and his vision for Trivandrum non-existent (he did come up with a hurried copy of the incumbent MP's vision document with some tired additions like an IIT!). And he has failed to display any interest in the development of the city whenever there's no election happening. Indeed one may suspect that he remains in stasis during the rest of the time and is only awakened when the polls are announced! And that brings us to the sitting MP, Dr. Shashi Tharoor. First and foremost, I have worked very closely with him on a variety of development initiatives over the last five years starting with persuading Oracle to open up an office in Technopark, resulting in other MNCs like Accenture and Cap Gemini deciding to set up operations in Trivandrum. The very fact that he is eminently approachable and responsive sets him apart. As does the fact that he is willing to accept and use inputs from citizens like you and me in influencing projects as small as a bus shelter or as big as the Vizhinjam port project. Second, he is the only MP that I know of who periodically publishes performance reports that lets his constituents measure how well he is doing in an objective fashion. That's transparency that even the AAP can only aspire to and exceeding the norms even in the US or Europe. The only other Kerala MP that has even come close is the CPM's M.B. Rajesh, someone I admire from my days as a student activist. Restructuring of the Rs 1,200 Crore NH-66 4-laning project and tendering of the first 23 Km stretch in parallel with completing land acquisition on the last 20 odd kilometers. This is the single most economically important stretch of road in Kerala, with the Karyavattom International Stadium, University of Kerala Technopark Phases I-III, VSSC, Trivandrum International Airport, the Kovalam tourism zone and the Vizhinjam port project all lined up along it - involving over Rs 20,000 Crores of investment and generating tens of thousands of jobs. Finalizing the master plan of the Vizhinjam deep sea port project, recasting it as a world-class container hub instead of just another middling port and getting environmental clearance in record time, a milestone in the 20 odd year history of the project. The MP also argued the case for maintaining the full Landlord model, albeit unsuccessfully in the face of opposition from the State Government and individuals within the Planning Commission. Attracting Oracle Corporation and Accenture to Technopark, paving the way for other MNCs like Cap Gemini to consider opening offices in Trivandrum - elevating our city above other Tier II IT destinations. Began or extended 14 trains to Trivandrum, oversaw significant upgradation of facilities at Trivandrum Central, pushed through the long pending MEMU service and sanctioned stops for key trains at Kazhakkoottam station to benefit the 50,000 employees at Technopark. Took key initiatives in his portfolios to establish the consulates of the UAE and Sri Lanka, offices of the AICTE, CBSE and KV and educational institutions like a center of the Central University of Kerala. Of course, there's much left to do in the next term. Like making sure that the first mega container ship sails into Vizhinjam on schedule, developing Trivandrum into a global knowledge hub through projects like the Knowledge City (whose diversion out of Trivandrum was only prevented by the MP's intervention), attracting global investors to the city and so on. It is not that there were no problems along the way. Yes there were, and I am sure Dr. Tharoor would be the first to admit that as a first-timer to the complex, intrigue-packed world of Indian politics, he has made many mis-steps ranging from a number of controversies on Twitter, to an avoidable albeit well intentioned involvement in the convoluted world of the IPL to the latest episode of visiting a meeting of pastors, where despite only appealing for their votes and support, and explaining the tragic circumstances of his wife's untimely death, as would have been done to any constituent or community leader, he has been accused of resorting to sectarianism by those who themselves have made divisive politics their fundamental operating principle. However, his perseverance and dedication to fighting through all these set-backs - most recently fighting a long, exhausting, bruising campaign close on the heels of the soul crushing loss of his wife, makes me believe that this candidate is a fighter, that he stands by his ideals and his plans. In short, he's the sort of man that we need to work for, hell, fight for, India's most underdog State Capital and to lead it to greatness. That he is globally renowned (Trivandrum is probably one of the few constituencies being covered by the global press!) and eminently qualified in every sense, makes the argument more pressing. I have seen him convince the top management of global entities, who scrutinize every decision thoroughly, to believe in and invest in Trivandrum, where whole investment meets have failed miserably. Trivandrum is transforming into a 21st Century city, one that all of us aspire to be citizens of. That needs a 21st century leader, a real visionary with the capabilities to execute in his own right, without having to lean on anyone. And I see only one candidate capable of doing that, Dr. Shashi Tharoor, and urge you to use your valuable votes to make sure that he gets five more years to get us where we need to be. Disclaimer: These are purely my personal views and may or may not be endorsed by any candidate, party or organization that I may or may not be associated with, at any time or in any capacity. Please make sure that you verify all facts mentioned in it independently. The article was composed of my own volition and not at the urging of anyone else or for any reward other than helping elect the best MP for Trivandrum! Before I come up with my customary Election evaluation, here's putting my recommendation up front. Stay tuned for an objective evaluation of why my opinion is strongly in favor of Dr. Tharoor again. 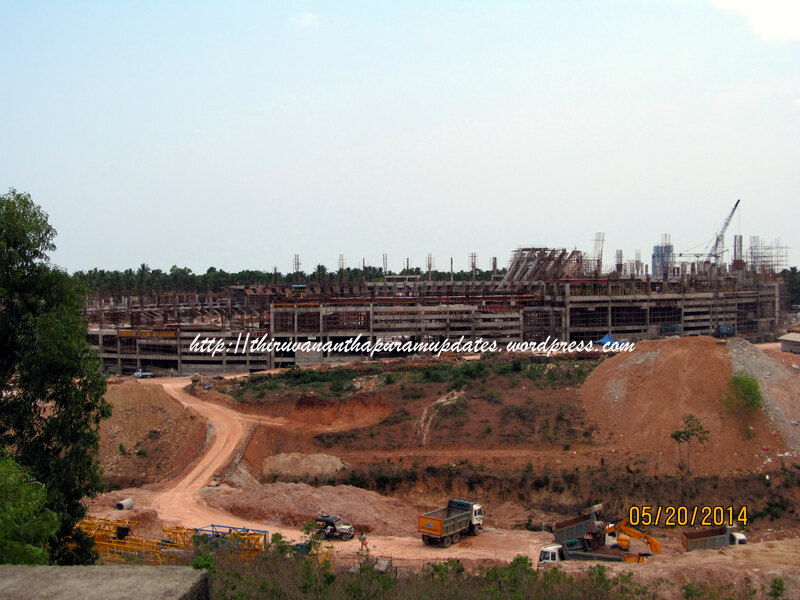 Kerala's most advanced stadium progressing steadily to a late 2014 inauguration. Many of us would find it hard to believe that the expansion of the NH-66, formerly the NH-47, the single most important highway in Kerala has been ongoing since 1974. That's before a lot of us were even born! The stretch of the NH-66 between Kazhakkoottam and Karode, on the Tamilnadu border was built two decades ago and land had been acquired 15 years ago for widening it to 4-lanes for the first 23 Km from Kazhakkoottam to Mukkola. Thereafter it got stuck with successive State Governments, MLAs and MPs showing scant interest in proceeding with the 4-laning project. Successive tenders to widen it on a BOT basis failed because of shoddy traffic surveys which failed to paint an accurate picture of the traffic potential of the stretch and because land acquisition had not been completed along half of the stretch. Kerala, after all, has the worst record in India with respect to vehement opposition to the land acquisition needed for widening highways. It's only been since Dr. Shashi Tharoor took over as MP of Trivandrum that any progress has been made. Recognizing the problem with land availability, or rather the lack of it, in the second part of the stretch, he got NHAI to split the Rs 1,170 Crore project into two parts and prompted them to get the 23 Km long stretch till Mukkola (near the site of the Vizhinjam deep water port) tendered first while constantly following up to ensure that the land acquisition process for the remaining stretch made it through the multiple stages mandated by the State and Central Governments. NHAI recently completed the qualification process for the first stage, with five companies-consortia becoming eligible to bid and the project is now in its final bid stage, with offers due on April 21st. Simultaneously, after a lot of drama, NHAI has approved the release of the first tranche of compensation to land owners in the second phase signalling the beginning of the last phase of work before tendering on this phase can also begin, hopefully before the end of 2014. Not to stress an obvious fact once more but the NH-66 between Kazhakkoottam and the Tamilnadu border is the single most economically important stretch of road in Kerala as it connects the three Phases of Technopark, Technocity, VSSC, the International Airport, the Kochuveli rail hub, Travancore Titanium Products and a host of small, medium and large manufacturers, the Kovalam-Poovar tourism belt (Kerala's single largest) and of course, the Vizhinjam deep water port project. Nearly a 100,000 people work along the road already and that will go up to 200,000 by 2017. Over Rs 10,000 Crore is being invested into physical and social infrastructure along the stretch. Thus the importance of getting this road developed cannot be over emphasized. Nearly 2,000,000 SF of office space is becoming operational over the next 3 months at Technopark in the form of behemoth buildings being commissioned by Technopark and home-grown IT giant UST Global. Here's a sneak preview of the two state-of-the-art, LEED Gold rated office buildings. In the foreground will be a 6-acre water body! The area in the foreground will have a 1,100,000 SF office building which will tower over 100 m.
The 12-floor high atrium takes over as the most impressive in Kerala, which is saying something given the massive atria of Technopark's Nila and Bhavani buildings. The lobby level sprawls over 80,000 SF. Had the open atrium not been there, the building would have had well over 1,000,000 SF of occupied space. The top floor hosts two pools, a gym and a client executive presentation area. All with a spectacular view! The ever growing cluster of buildings in and around Technopark, a whole new city! In the foreground (to the right) is the site for the second Phase of the UST Global campus which will see a 1,200,000 SF building and an MLCP. Technopark Phase III - Ganga and Yamuna - 1,000,000 SF; 12 floors, 85 m.
Photo Courtesy: Forumers Damukannappan, Rajkrish and Srnphotos at Skyscrapercity.com Click on the link for more photos. Here come a few more of my comments in The Hindu Metro Plus. Do let me know your thoughts on the same, and stay tuned for a more substantial end-of-2013/beginning-of-2014 post!